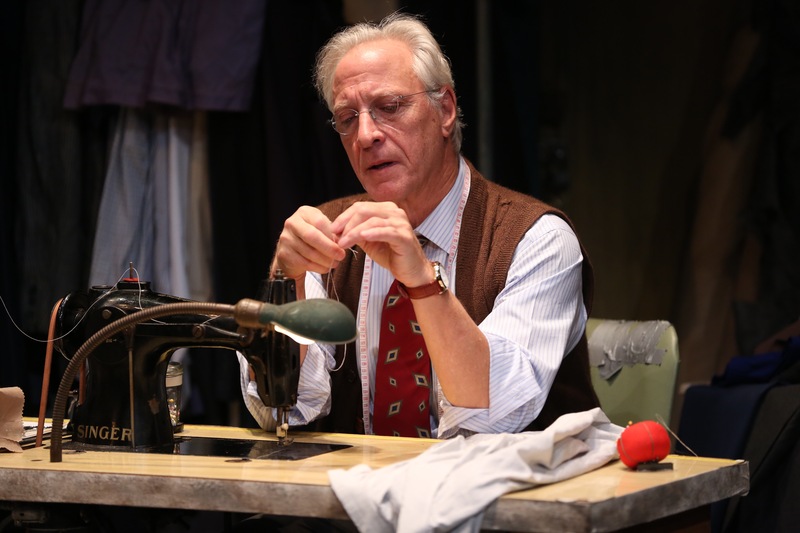 “Life is about choices”, so says Gio, the gentleman tailor at the center of this drama. 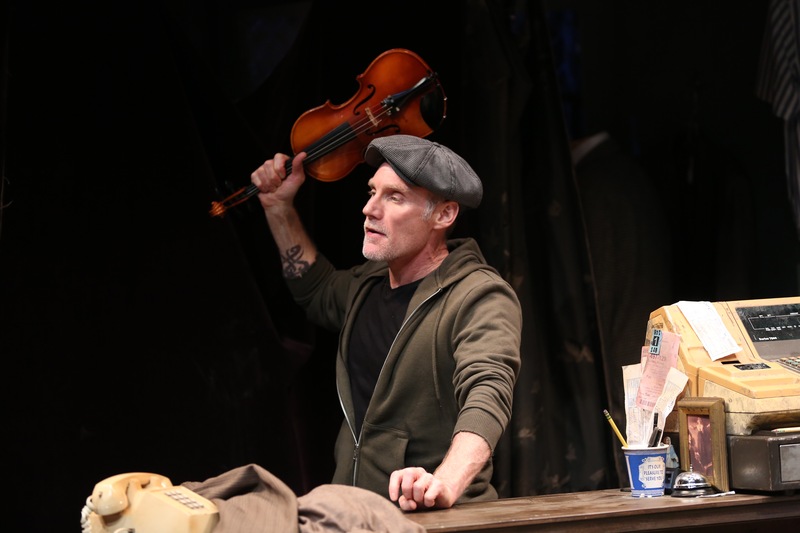 And in The Violin, for the most part, good choices have been made by Dan McCormick (The Morons) who wrote this fascinating tale of brotherly and pseudo-paternal love that plays out in his tailor shop on Avenue A in the East Village of Manhattan. 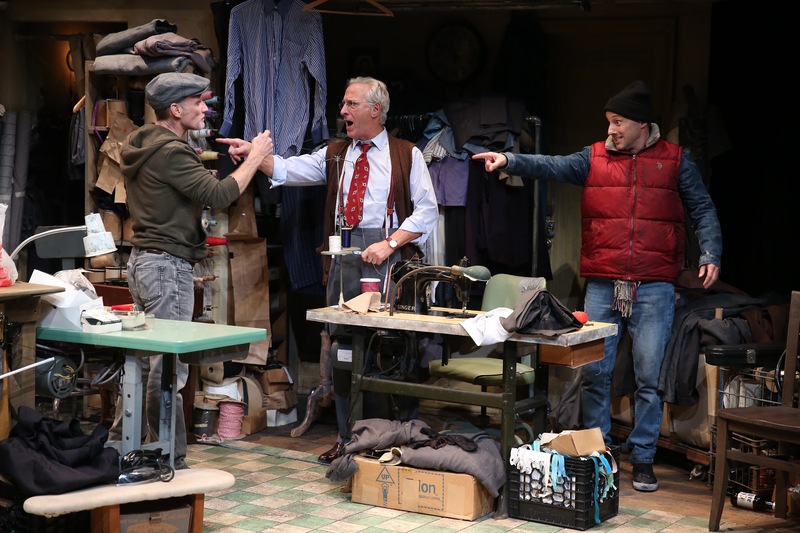 Directed by Joseph Discher (Theatreworks’ Red), the engaging and slightly predictable story of characters that are so desperate for some sort of salvation play out with an authentic air and convincing attachment. It’s fairly clever and well put together, much like Gio’s supposed gift of mending other people’s torn clothes. It’s just a shame that Gio has a harder time stitching these two brothers’ lives back together again. 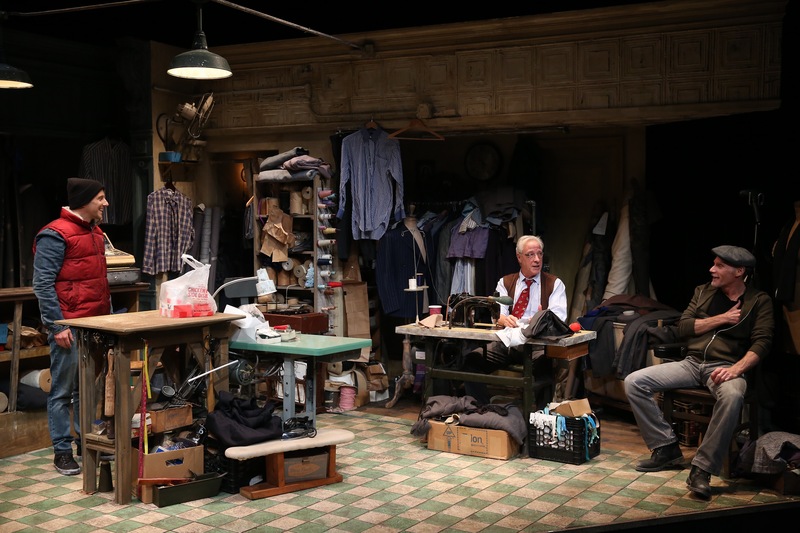 Gio, portrayed with paternal layers of care, love, and frustrating concern by Robert LuPone (Broadway’s True West) struggles against his aging body repairing clothes for his unseen customers in the tailor shop his late father established many years ago. He’s definitely the father figure to the two young men that can’t seem to stay away even when they find his fatherly role hard to take. 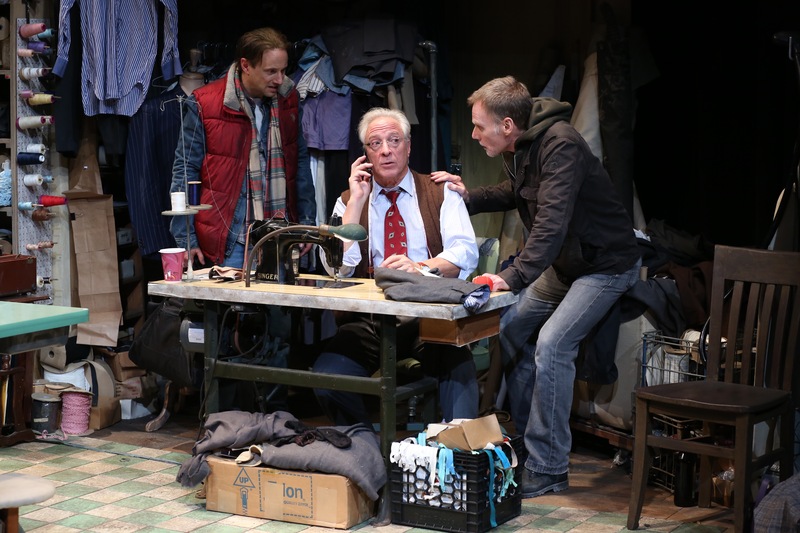 Drinking beer and pacing the room, there is the troubled Bobby, played with an edgy aggression of a man struggling with inner genetic demons by the very good Peter Bradbury (Broadway’s King Charles III). 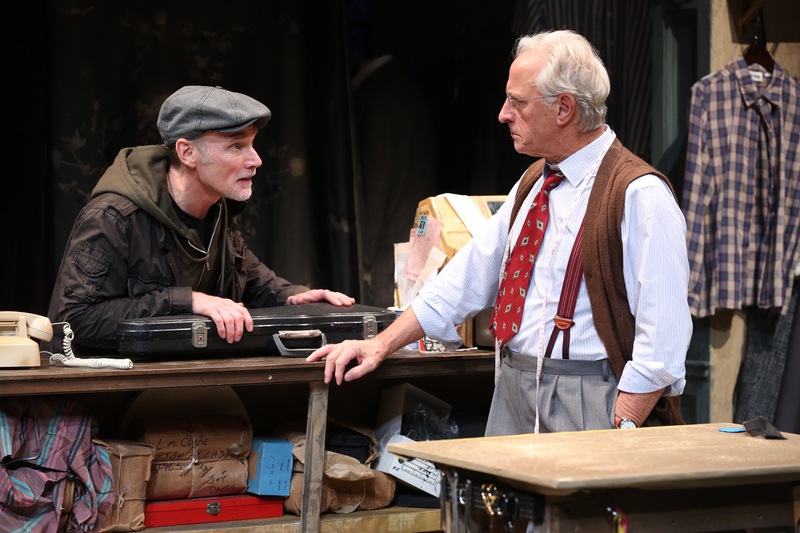 He definitely has a strong bond with Gio and even when the moments that don’t ring entirely true poke their head into the beautifully designed space (set: Harry Feiner; costumes: Michael McDonald; lighting: Matthew E. Adelson; sound: Hao Bai), it never feels completely false either. It feels like a father/son dynamic, that is both argumentative and loving. Terry, devotingly played by Kevin Isola (MTC’s Brooklyn Boy) is the younger brother who is both sweet and kind, while being oddly simple. Bobby explains at one point that he feel out of his bunk bed and has never been the same, something that clearly bothers Bobby, filling him with guilt that it should have been him in the top bunk. That explanation is one of the numerous moments that feels unnecessary and too simplistic to accept, and it is not the only one that maybe could have been left alone, without the need to diagnose. It’s enough that with the murder of these boys’ parents so many years ago, it is clear that Gio is the father figure employed by the two, and that Bobby feels responsible for his challenged younger brother. Isola’s performance is so wonderful that he causes us to join with his brother in the desire to care for the sweet boy. The complication is that Bobby is ill equipped for the task, and no amount of mentoring by Gio seems to help bring Bobby back to the respectable and solid world he needs or should be in. Then, as if a tainted gift from God falls into their laps, a very valuable violin has been accidentally left in the back seat of Terry’s gypsy cab. The intoxicated musician has no recollection as to where he lost it, but is desperate to get it back. Valued in the millions of dollars, Bobby sees it as salvation from a life that always seems on the verge of destruction, and naturally Terry follows his lead. Terry’s character is quite charming, parroting whomever is speaking at the time, especially if it is Gio talking. I never really believed in Gio’s response to this scenario, no matter how desperate and unfulfilled his life is presented to be. But the three formulate a plan that they hope will save them from the dark future they see before them. The performances are all excellent and relatable, even when they veer into the implausible. We are engaged and sweetly pulled into their lives and struggles, even as the play straddles the simple and predictable. I can’t say that I was moved to tears by The Violin as some patrons around me were, but the direction and the pace never faltered until the touching (and slightly not surprising) finale. Gio can’t mend these boy’s lives as well as he mends a pair of pants, but he certainly wants to pull us into his attempt at fatherhood. Next Wicked: A Green Witch Can Be A Good Witch, Hazel.